Trinity celebrates both traditional and contemporary services each Sunday morning. The traditional service begins at 8am; the liturgy and hymns for this service are found in the current Lutheran Service Book hymnal and are accompanied by an organist. There are four settings of the liturgy which repeat throughout the year. The contemporary service begins at 10:30 a.m. and familiar aspects of the traditional service are present in a different style. 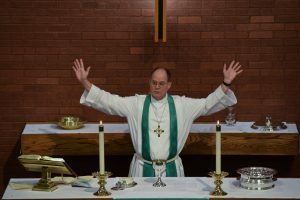 The liturgy and songs are printed in the worship bulletin and are accompanied by a worship team of singers and musicians on the piano, acoustic, electric and bass guitars and the cajon (percussion). In the Summer (typically late May through mid-August), one combined service is celebrated which alternates between the traditional and contemporary formats. With rare exceptions, communion is offered every Sunday at each service.